Microsoft’s Don Mattrick pulled back the curtain on the Xbox One at a live event at the company’s Redmond campus, and it wasn’t long at all before the talk turned to software. One application in particular has been the subject of speculation for months, and SVP Yusuf Mehdi confirmed that Skype (which, if you recall, Microsoft acquired for $8.5 billion nearly two years ago) is part of the Xbox One experience. As you might imagine, the Xbox One Skype application allows users to participate in group video chats with their fellow users using the Kinect camera — so there are opportunities for a natural type of ongoing conversation, one that won’t require you to chat for 30 minutes and then disconnect. This could be an “always on” situation. 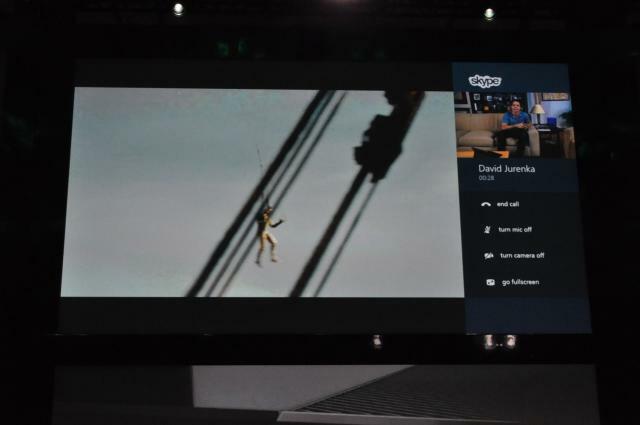 You can answer a call by saying “Xbox, answer call” and then the video screen slides in from the right. Since the Xbox One aims to be your all-in-one “Home Entertainment System,” Skype is going to play a huge role in the overall experience. The demonstration showed a group Skype conversation happening while watching a video, with video quieting down a bit once the call is connected. Microsoft has always talked about being the hub of the living room, and it seems like the newly announced Xbox One is the device that brings its vision to reality. The game-changer with this Skype integration is that you can watch a television show or play a game while carrying on a conversation. This has been attempted, mostly as a “second screen experience,” but to make this a seamless reality is a huge step forward for Microsoft. Until now, you were constrained to the functionality of a particular game supporting voice chat, but this gives you a more personal experience no matter what you’re doing on your Xbox.